The Internet has become the new yellow pages. Can your customers find you? If you don’t have a website, perhaps they can’t. Having a website is the most basic component of promoting your business in today’s connected world. Today, Content Management Systems (CMS) make it much easier for business owners to maintain their own websites than in the past. Why use a template-driven Content Management System such as WordPress for your website? There are many good reasons, but the best reason by far — you are in control. It’s faster. The WordPress Dashboard makes it faster and easier for me to update my own website content using only my web browser. In my business, time is money and I don’t always have a lot of time to work on my website. Now, it’s easier to keep my website up to date. I also was able to get my new WordPress website up and running right away because I didn’t have to write all the html code required in building a brand new site. It’s cheaper. Hiring a web designer to design your web site from scratch and make the day-to-day changes for you can get expensive. Not many people possess the programming skills and necessary software to work on their own web sites. In the long run, you will save a bundle. I can do it myself! It is gratifying to be able to be hands-on with your own web site. If you get stuck, then you can call for professional help. Added Functionality. This may be the best reason of all. WordPress makes it easy to add plug-ins that extend the functionality of your web site. There are a wide range of plug-in options out there for you to consider: event calendars, image sliders, contact forms, shopping carts, and more. SEO optimization is big topic today, and yes, WordPress has plug-ins for that too. Lots of Themes. WordPress is an open-source platform which means there are a lot of developers working to develop new themes and plugins all the time. That makes it easy for you to change the appearance of your site by installing a new theme. Perhaps you’ve considered having a website but you didn’t think you could afford one… now you can! 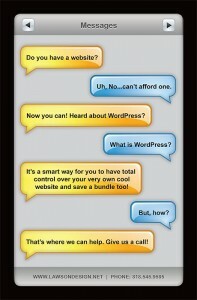 Jeff Lawson Design offers very cool and economical WordPress-driven websites. A WordPress website is a smart way for you to be able to manage your own website content and save a lot of money in the process! Today, both small and large businesses are turning to the world’s most popular free content management system for their company website needs. Where do I Start? Lawson Design will guide you through the process of getting a domain name and hosting server, then we create your new WordPress website. Starting at $750*, we will set-up and customize your WordPress template theme with original graphics, a navigation menu, up to 10 topic pages, install any plug-ins or widgets, and add your text and photo content to get you started. Once we’ve done that, we’ll give you written instructions on how you can then manage your new website using your web browser. Of course, we are always available to you if you get stuck or need something special. * Excludes domain name registration fee ($7-15/yr) and website hosting server plan ($7-12/mo). Based upon up to 10 pages of content. Premium themes and plugins are additional. E-commerce sites and sites with more pages, graphics or content will cost more.